Review: He’s back. I mean, he always said he’d be back…right? After exercising his political muscles as Governor of California and appearing in a few cameo roles (like The Expendables 2) Schwarzenegger is back headlining another shoot ‘em up actioner that’s heavy on ammunition but light on any semblance of subtlety. Ok, I’m sure you wouldn’t be lining up to see a Schwarzenegger flick that’s described as subtle but is it too much to ask for a film of this ilk to play to the strengths of its star? 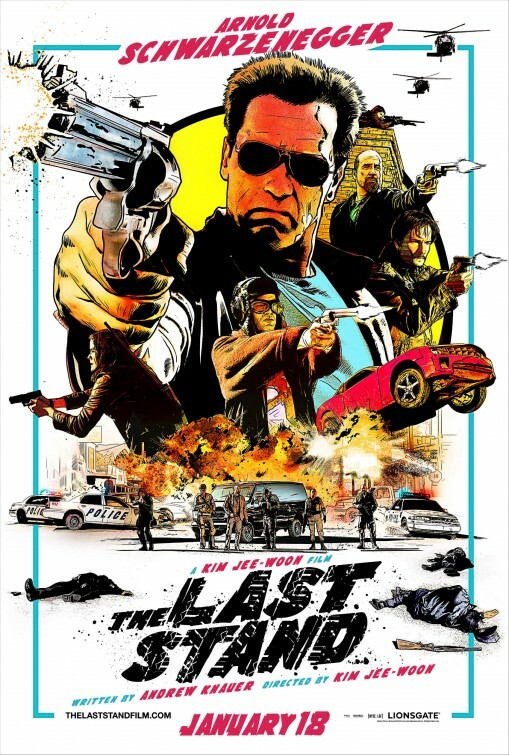 Though it’s constructed and filmed with its head firmly planted in 80’s action flicks, The Last Stand seems to forget that these films were fun at heart so it sacrifices some great camp opportunities in favor of letting its cast shamefully overact amidst dizzying gun battles and laughable moments of misguided exposition. It’s probably not a good thing if you come away from a film saying that Schwarzenegger was the best actor of the bunch…or am I wrong? Schwarzenegger heads the cast as a sheriff of a small border town going head to head with minions of a drug lord (Noriega, Tesis) that have descended into town to clear the way for their boss to continue his escape from federal agents into Mexico. The premise sounds like a perfect fit for Schwarzenegger and to a large extent the actor glides easily with the material. The problem is that the soggy script from Andrew Knauer, Jeffrey Nachmanoff, and George Nolfi feels like it has been around for over a decade and it’s gathered a lot of dust. I keep considering that maybe it was a pet project for Schwarzenegger before he took office. Respected Korean director Kim Jee-Woon (I Saw the Devil) is making his US debut with the film and I can only liken it to when Hong Kong’s equally well-regarded John Woo made his first picture stateside, the misfire Jean Claude Van-Damme vehicle Hard Target. It’s clear the director has style and good instincts but he seems restricted here and never guides the picture to achieve a balance between all of the elements it introduces. That goes double for a largely forgettable cast that’s all over the map. Whitaker looks totally lost in it all…until the movie forgets that he’s a top billed actor and jettisons his character for the latter half of the film. Knoxville continues to play arrested development imbeciles all the way to the bank and his pajama wearing, gun-loving doofus is anything but the comedic relief it’s intended to be. As the right hand man to the kingpin, Stormare once again goes for the gold in the crazy meter and achieves liftoff early on. Alexander, Gilford, Guzman, and Santoro are Schwarzenegger’s allies but any attempt to make them dynamic characters is a failure. That leaves us with Schwarzenegger to make the picture tolerable and he almost makes it work. With some guffaw-inducing scenes where he looks positively crazy thanks to his nutso hairstyle, the movie begins to buckle under the weight of so much wasted energy. At a baffling 107 minutes the movie could use a 15 minute trim, tightening up the action scenes and losing needless detours involving Schwarzenegger’s past. Though there are a few clever methods used to dispatch the endless array of bad guys, The Last Stand is sadly not the comeback picture that I’m sure Schwarzenegger intended it to be — it’s embarrassing box office performance assures that no sequel will be considered. Schwarzenegger already has several other projects in the works so let’s chalk this one up to the star dipping his toes back in the pool he helped fill throughout the 80’s and 90’s.